Earlier this afternoon, AMs debated the draft withdrawal agreement ahead of a vote in the UK Parliament scheduled for December 11th. 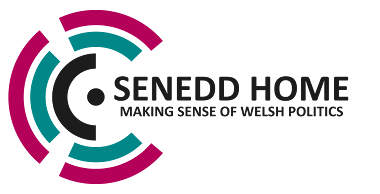 A report from the External Affairs Committee on the implications of the withdrawal agreement for Wales was summarised and posted on Senedd Home yesterday. Further committee reports on Brexit will be coming over the next few days. Believes the future relationship as envisaged by the Political Declaration falls short of the model for the UK – EU future relationship set out in Securing Wales’ Future (Welsh Government-Plaid Cymru white paper), which provides robust guarantees in respect of workers’ rights, human rights, equalities legislation and citizens’ rights. Notes that the UK Government’s long-term economic analysis projects the UK economy will be worse off by 3.9% over 15 years under the current Withdrawal Agreement and Political Declaration. Believes the UK Government should declare its intention to negotiate on that basis and that if it fails to do so, there should either be a UK general election, or a public vote to decide the terms on which the UK leaves or whether it wishes to remain in the EU. Two hours were scheduled for the debate (Westminster’s will take place across 5 days for comparison). The Finance Secretary, Mark Drakeford (Lab, Cardiff West) described Brexit as the biggest challenge facing the Senedd since devolution, turned into a full-blown crisis by the UK Government’s ineptitude. The Secretary was broadly supportive of aspects of the Withdrawal Agreement, which he said was close to the Welsh Government’ position with a few exceptions, but the Political Declaration – which will determine the long-term relationship after the transition period ends in December 2020 – was unacceptable due to the rejection of a permanent customs union and full participation in the single market. A renegotiated deal which includes the latter may be supported by the Welsh Government, but would likely have to be negotiated by a new UK Government. The Welsh Government refused to support a Plaid Cymru amendment which called for a second referendum under any circumstance. They would, however, support one in the event the deal is rejected by the House of Commons and there’s no UK general election as a result. The Chair of the External Affairs Committee, David Rees AM (Lab, Aberavon), ran through some of the main findings of their report on the implications of Brexit for Wales. He was in no two minds that this was a poor deal but believed an election would be as appropriate a way to “go back to the people” as a second referendum would be. 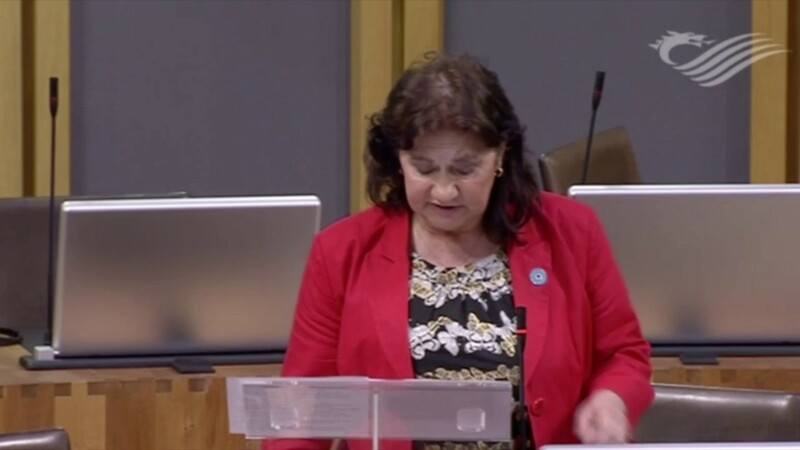 Dawn Bowden AM (Lab, Merthyr Tydfil & Rhymney) supported pausing the Brexit process (effectively extending the Article 50 period) and renegotiation – particularly in the area of workers’ rights and employment law. Plaid Cymru was disappointed the Welsh Government didn’t take a stronger stance on the agreement. Steffan Lewis rejected a Welsh Government assumption that a “No Deal” can be avoided by voting down Theresa May’s agreement – the only thing that would do so is a renegotiation or remaining in the EU. There’s also no guarantee AMs will get another vote on this. Lynne Neagle AM (Lab, Torfaen) would vote in favour of Plaid’s amendment calling for an outright second referendum; she can’t vote for anything that would make her constituents poorer. The Brexit debate has been dominated by false choices, such as extra money for the NHS, and the deal or no deal scenario was another one. A “People’s Vote” was the only way to settle this and momentum was growing. This sentiment was later echoed by Joyce Watson AM (Lab, Mid & West Wales). Adam Price AM (Plaid, Carms. 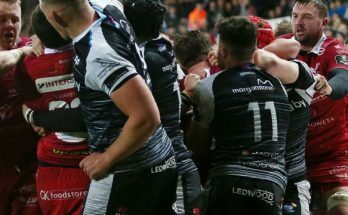 E & Dinefwr) said the referendum should always have been a two-stage process because there were a whole host of possibilities and no definite proposal on the table in in 2016. “I’m asking for the people to cast their judgment on a policy that was never put before them, because there wasn’t even a scintilla of information put in front of them in terms of what you’re (Conservatives) actually proposing. Sian Gwenllian AM (Plaid, Arfon) and Rhun ap Iorwerth AM (Plaid, Ynys Môn) both raised the impact Brexit would have on the economies of their constituencies – EU academics working at Bangor University and both the Port of Holyhead and farming respectively. Leader of the Opposition, Paul Davies AM (Con, Preseli Pembs. ), said healing divisions after the Brexit vote won’t be easy, but it was necessary and it was time to respect the wishes of the electorate. Nearly all of the Labour, Plaid and Lib Dem members represent constituencies which voted leave. 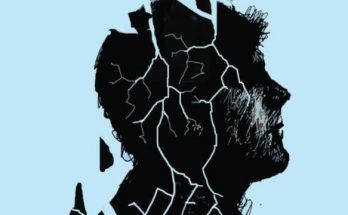 A failure to reach a deal by next March will see the UK “crash out” – and it won’t just be the big businesses suffering, but small and medium-sized ones too. 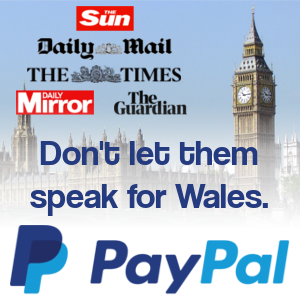 David Melding AM (Con, South Wales Central) said that while he will happily campaign for the UK to re-join the EU, the deal was a good one, removing the danger of a disorderly Brexit and enjoying the support of the business community. He didn’t believe there was visible demand for a second referendum and it was a job for all politicians to win over citizens and rebuild the post- Second World War social contract – not shatter their faith in democracy by overturning the referendum result. Mark Reckless AM (Con, South Wales East) was a bit surprised by the tame wording of the motion which didn’t seem to have a position on the withdrawal agreement within the text. Mohammad Asghar AM (Con, South Wales East) talked up the UK’s prospects after Brexit, outing himself as one of these people who think the “Great” in Great Britain is an honorary title not a geographical name. In particular, he wants to seize trade opportunities with emerging and fast-growing economies instead of being tied into a relationship with just 27 other countries. We will be able to trade with China, Japan and Brazil (….because we can’t now). 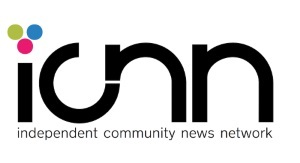 The vote is nothing more than AMs expressing an opinion and carries no weight. 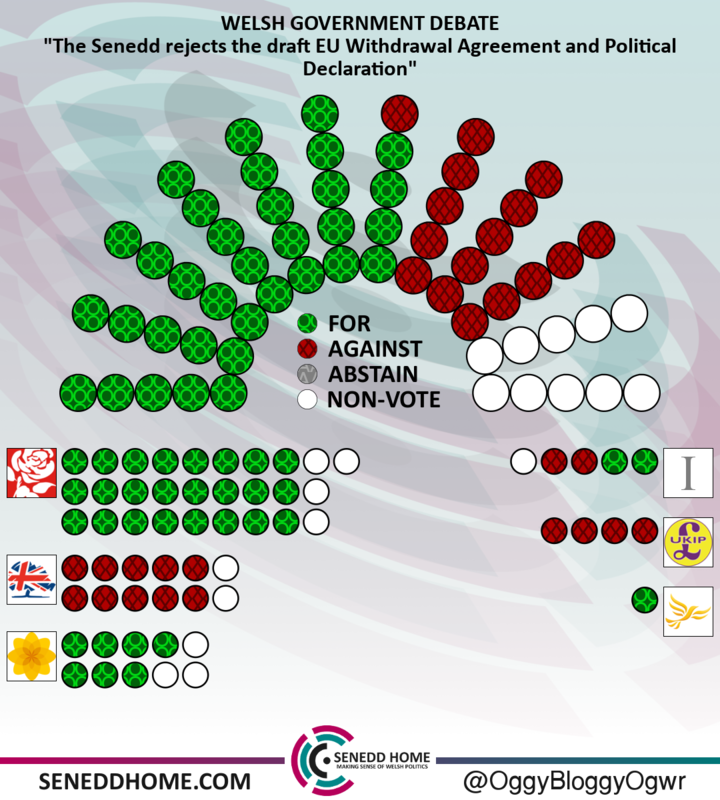 In the end, there was clear support for the first Plaid Cymru amendment – essentially a stronger-worded version of the original Welsh Government motion but with an outright rejection of the withdrawal agreement. However, Plaid’s second amendment calling for a no strings attached People’s Vote was rejected by 11 votes to 39. Edit: I forgot to add this – the independents who voted for the motion were Neil McEvoy AM (Ind, South Wales Central) and Jenny Rathbone AM (Lab–Ind, Cardiff Central). The two who voted against the motion were former UKIP AMs, Caroline Jones AM (Ind, South Wales West) and Mandy Jones AM (Ind, North Wales).